In October 2016, Betknowmore launched a new outreach support project called ‘Don’t Gamble with Health’. 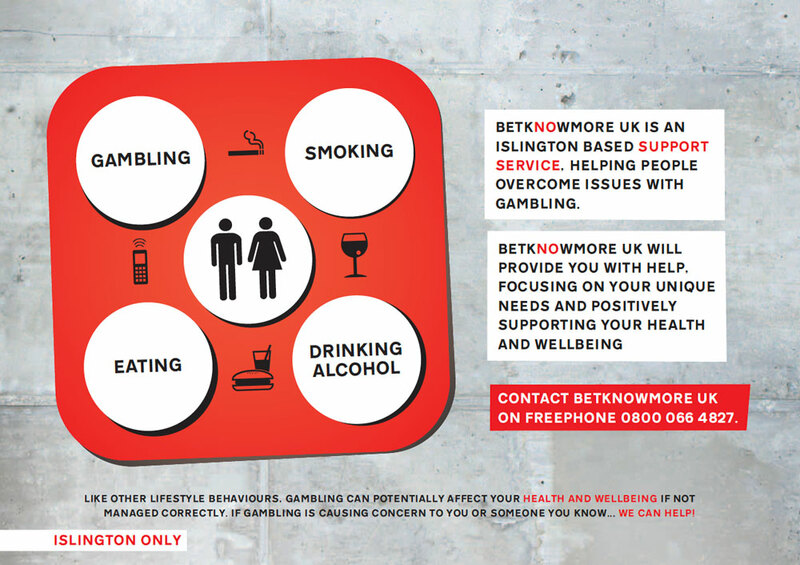 The project launched in collaboration with a range of stakeholders and funded by Gamble Aware, allowed Betknowmore UK to work directly with the betting shops in Islington and provide rapid support to betting shop customers who felt their gambling was proving problematic or concerning to them. Customers can self-refer or complete a referral card which is submitted to shop staff, who then contact the outreach team. Support is provided to customers within a 48-hour window. Provide gambling support services to local communities, particularly the more vulnerable members of the population. Increase the capacity of the gambling support sector by working co-productively with a range of stakeholders. In this case, the ABB, local voluntary and statutory services and Islington local authority. Provide new and innovative services for the sector, with a focus on quickly delivered tailored and holistic support. Feedback from our clients is that they prefer the focus on promoting their health and well-being, rather than being labelled an ‘addict’. Provide education and awareness to other organisations working with people with gambling problems, such as the drug/alcohol sector, and ‘upskill’ their front-line workforce. Take the view that all forms of gambling have the potential for harm and that many gambling dependent people gamble on a range of gambling products and services. Clients supported in this project have used gambling services including electronic machine gaming, on-line and phone apps, scratch cards, arcade and sports betting.